Maya 2018’s new Visibility mode shows rig controls only when the mouse cursor moves near them, reducing viewport clutter when working with complex rigs. Check out the other new features in the release below. Autodesk has released Maya 2018, the latest update to its 3D modelling, animation and rendering software. The release makes Viewport 2.0 Maya’s primary viewport display, and adds a few new modelling and animation features, plus improvements to the Bifröst fluid simulation and MASH motion graphics toolsets. One of the biggest changes in Maya 2018 is that the software is now “fully transitioned” to Viewport 2.0, making it the primary viewport and hardware renderer. The old legacy Default and High Quality viewports are no longer available in the Maya UI. 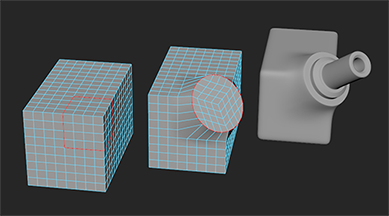 The online documentation also lists a number of improvements to Viewport 2.0, including support for OpenSubdiv 3.1 and improvements to displacement previews. Most of these were actually rolled out in Maya 2017 Update 3, although there do seem to be a few completely new options, like transparency mapped shadows. New modelling options include a Circularize command, which converts selected geometry into a perfect circle, making it easier to create circular extrusions that blend with a base mesh. Support for symmetrical modelling has been enhanced: global symmetry is now “respected across all tools”, and sculpting is now mirrored on topologically symmetrical meshes, even if they are posed asymmetrically. Other changes include new hotkeys to transform, duplicate or extrude geometry in Component mode. The video above also shows a number of improvements to the UV Editor, but again, these were rolled out in Maya 2017 Update 3, so if you’re on a subscription, you should have them already. In animation, the clip-based Time Editor introduced in Maya 2017 also gets a few new features, including a new Loop Progressive option for generating complete movement cycles from shorter animation clips. Character animators get a new Visibility mode (top of story), which only displays rig controls when your mouse cursor passes close to them, reducing viewport clutter when working with complex rigs. The Lattice deformer is also now GPU-accelerated. Again, there are also a number of features rolled out in Maya 2017 Update 3, including improvements to the graph editor and handling of frame rates in imported media; a new Tension deformer for creating surface tension effects; and the option to bake the output of deformer-based rigs to skin weights. You can see some of the new animation features in action in the workflow video above. In rendering, the Render Setup system has been reworked to “make it easier to create and adjust collections and overrides, as well as sequence and batch render”. The version of Arnold bundled with Maya has also been updated to Arnold 5. New features include the new physically accurate surface, hair and volume shaders, light path expressions, and improved sampling. In the simulation toolsets, the Bifröst fluid simulator gets new options to cache meshes on a per-frame basis as BIF files, and to restart caching from the last frame successfully cached with the same settings. There are also six new attributes for controlling foam generation, including air turbulence parameters, boundary drag, and ‘micro vortices’ for creating fine structures within foam. BOSS, Bifröst’s system for simulating ocean surfaces, can also now output foam maps. The MASH motion graphics toolset gets new primitives aimed at creating complex abstract objects, including discs, gears and ‘super shapes’; and a new Bullet physics-powered Dynamics node (above). There is also a long list of enhancements to existing nodes, but note that the new World and Placer nodes, and improved handling of type and SVG files, date from Maya 2017 Update 3. The documentation also lists changes to hair and fur grooming in XGen, including new Clump, Collision and Cut modifiers, but again, the key features came out in Update 3, so check our original story for details. The Node Editor also gets new styles for connection lines, helping to control the look and layout of the resulting node graph, plus a few other workflow changes. There are also changes originally rolled out in Maya 2017 Update 3, including support for Dash scripting. Performance improvements include a new HIK evaluator, which boosts the speed of HumanIK characters by “up to 6x”; and hiding elements in the viewport now properly excludes them from evaluation. Updated 26 July: So far, the response to Maya 2018 on community forums has been fairly positive. Of the new features, the rig Visibility mode, MASH Dynamics and new features in Bifröst have been singled out for comment, although the most popular change is not an actual feature, but the long list of fixes. Maya 2018 is available for Windows 7 and 10, Red Hat Enterprise Linux 6.5 and 7.2 WS and CentOS 6.5 and 7.2, and Mac OS X 10.10.5 and above. As with all of Autodesk’s software, licences of Maya are available on a subscription-only basis, starting at $185/month or $1,470/year.